On sale in Alive, Supplements Plus, and Morning Sun Flyer until January 31st! 30 vcaps for only $55.99!! Buy 4 and get additional 5 % OFF! is one of Canada’s Natural Health authorities. Her specialties are in Hormone Balancing and Women’s Health. She continues to innovate new quality products in order to help millions of people around the globe with their health care needs. enhance serotonin which in turn helps with blood sugar cravings and appetite control! Customers often come into Alive Health Centre, Morning Sun and Supplements Plus asking for that MAGIC PILL and this product is the first one that comes pretty close! 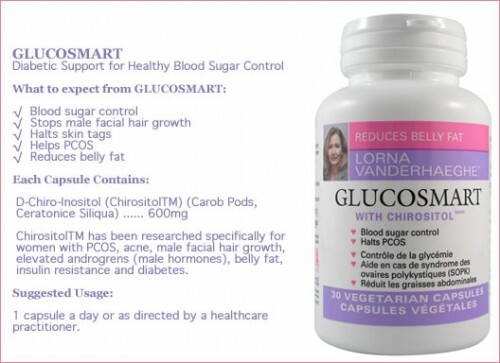 To learn more about Glucosmart, Lorna Vanderhaeghe has written an excellent article explaining the benefits, the active ingredients (Chirositol), the dosage and more! As always thank you all very much for reading and if you have any further questions we are happy to help you at a location near you! The “Alive” magazine is not affiliated with Alive Health Centre. The Alive magazine is their own company and has never been a part of Alive Health Centre and chains. They do have a “letter to the editor” section where you can submit your concerns. The Alive Health Centre blog is meant to be a source of information, and we do not have any ads on this website. We offer coupons once in a while within an article and if many customers are asking about the price we include that in the article. For the most part we generally try to keep the blog as a source of information. All the best and have a great week. I have PCOS and im going to be doing in vetro at the end of August. I was wondering if the gluecosmart and the Estrosmart would be beneficial to take before hand to help with implantation and a healthy uterus. Hello Georgina, Glucosmart will help with belly fat and blood sugar problems. ThyroSmart is excellent for an underactive thyroid. If her hormones are severely out of wack and she has lost her period I would highly recommend Martin and Pleasance Harmony PMS. It is extremely safe as well as effective. As far as getting quality nutrients I would recommend VEGA One as it will give her 50% of her recommended daily value of vitamins and minerals. Also there are probiotics, fibre and protein. I hope this helps and I wish you and your daughter all the best. Make sure you consult your health care practitioner as she is taking metamorfin and perhaps other medications. Hello Natalie. I hope all has gone well with vetro. Yes GlucoSmart and EstroSmart would be helpful in general for your overall hormonal health, but it is best to speak with your health care providers so they are aware.